Legend has it that Loch awe, at over twenty five miles in length, the longest stretch of freshwater in Scotland, was created by a witch and lived in by an evil monster even more fearsome than the one at loch Ness. Dotted around the north of the loch, where it is joined by the A819 from Inveraray to Oban, are several tiny islands which now sport picturesque ruins, on Inishail you can see a crumbling thirteenth century chapel which once served as a burial ground for the McArthur clan,, the ruined castle on the Fraoch Eilean dates from the same period. If you have time to linger, it’s worth seeking out two interesting churches in the area. The first is the unusual octagonal Dalmally parish church, built in the early nineteenth century and set on high ground above the River Lochy beyond the village itself, two miles east of Kilchurn. The second, St Conan’s church in the village of Lochawe, a mile or so west of Kilchurn, was designed in the early part of this century by a Campbell, whose foray into every style from roman to Norman manages somehow to meld successfully. 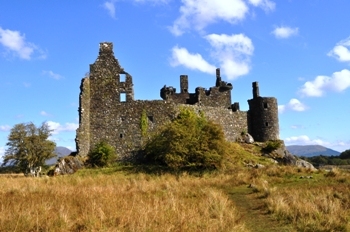 Loch Awe is also famous for its trout fishing, and Salmon also makes it way through the loch, heading past the barrage into the nearby River Awe and following on into the River Orchy. Another great place to visit in the loch awe area is The Cruachan Power Station and Pass of Brander, carved into the massive granite mountain of Ben Cruachan is the power station that provides excellent tours to visitors that takes you deep into the mountain to a viewing area to see the generating room, this uses water from a loch high upon Ben Cruachan, this visitor attraction can get very busy during the summer months so make sure you are there early enough to get a ticket. At the mouth of Loch Awe there is a dam built to maintain the right level of water in the loch, this dam also has a special lift installed to ensure the salmon can get up river to spawn. There are plenty of Hotels and Cottages to book around the area and Oban is only a short distance away, overall the area has a fantastic amount of visitor attractions and you will never get bored, it is an ideal location to have a Holiday in Scotland.